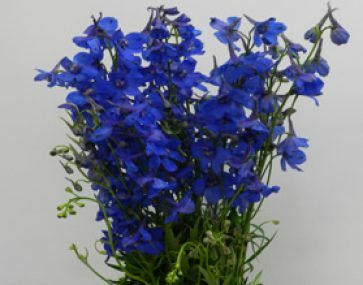 Eating any part of the delphinium can cause vomiting and even death. The juice of the flower was used as blue ink. Delphiniums have lots of small flowers travelling up a long stem. They are generally blue, but there are also purple and white varieties. Look for stems that are not bendy and where flowers have not started dropping off. Cut a minimum of 2cm off the stem, strip the bottom leaves off, and put in cold water with a flower preservative. Change water daily for optimum lifespan.Keep cool. This flower is very sensitive to ethylene. Keep them away from fruit, car exhausts and cigarette smoke.